In a world of hour-by-hour schedules, deadlines, and last-minute modifications, changing my commute was the last thing I wanted to do when I heard about the viaduct closure. We were told to prepare for two weeks of gnarly commutes, and since I work for WSDOT, I thought I better heed the warnings of my colleagues on the Alaskan Way Viaduct team, especially because I commute to downtown from West Seattle. Many commuters were accompanied by their bikes as they waited to board the West Seattle Water Taxi Friday morning. Competitive by nature, I decided the best way to determine the quickest way to work was to organize a side-by-side race. I asked a woman on my 21 express bus, Carrie Richards, to record her trip while I took the King County water taxi. I chose Carrie because I see her on my bus, morning after morning, trekking to downtown from West Seattle. And she doesn't mess around. She's often the first person off the bus once we hit downtown and once off, she race walks to her downtown destination. My thoughts: game on – this will be fun. The race: 35th Avenue SW and SW Trenton in West Seattle to Third and Seneca downtown. had 183 passengers – far below the capacity of 278. 6:45 a.m.: We both left 35th and Trenton at the same time. I travelled behind her bus in my car. 6:48 a.m.: I passed her bus as it stopped to pick up passengers. 6:55 a.m.: I arrived at the Seacrest Dock. There was plenty of parking on Beach Drive*. I was 26th in line for the 7:15 a.m. water taxi. 7:05 a.m.: Carrie was on the West Seattle bridge; she said it was crowded. 7:15 a.m.: Carrie reached Fourth Avenue. 7:17 a.m.: My taxi left West Seattle carrying 183 passengers. This turned out to be the first of two back-to-back trips with the most riders of the morning, more than tripling the regular ridership, according to King County, but still with plenty of room. 7:20 a.m.: As I raced across Elliott Bay, Carrie was at Third and Cherry. 7:24 a.m.: Carrie arrived at Third and Seneca. She'd won! 7:27 a.m.: My taxi arrived at Pier 50 in downtown Seattle. 7:37 a.m.: After practically running up the hill, I arrived at Third and Seneca. Notes from Carrie: The biggest choke point in the commute was definitely Fourth Avenue, in the areas where there is no bus lane. I was pleasantly surprised that I was able to catch my second bus (from downtown to First Hill) at the usual time after leaving home only about 15 minutes earlier. I'm a little anxious about next week though, since my impression is that a number of people took today (Friday) off from work. My notes: Just for the record, I could have left 10 minutes later and almost beat Carrie's time by arriving at Seacrest Dock in West Seattle closer to the 7:15 a.m. departure time. I was 26th in line and everybody that was in line got on the boat. The Water Taxi is a well-oiled machine. They shuffled people on and off the water taxi with military efficiency and precision. But next week, will it hit its capacity? The boat can handle 278 passengers. We had only 183 aboard my boat. I understand there's also room for 26 bikes on each sailing. Stay tuned for a rematch on Monday. Additional parking is available for Water Taxi commuters during the Alaskan Way Viaduct closure. SW Bronson Way is an unpaved parking area south of Salty's restaurant. It is unmarked, but holds about 40 cars. The Pier 2 parking lot is a secured parking facility holding more than 200 cars. It will be staffed Monday through Friday, in the morning from 5:45 a.m. to 9:15 a.m. and in the afternoon between 4 p.m. and 7:15 p.m. Cars will not be accessible outside of these hours. King County suggests you park here 20 minutes before sailing time. The shuttle will run the .6 mile route continuously between Pier 2 and Seacrest Park. Seattle-area roadways will be a major challenge starting this Friday, April 29, when the Alaskan Way Viaduct closes for approximately two weeks. The closure will give our contractor, Seattle Tunnel Partners, the time they needs to tunnel beneath the viaduct. It will give drivers a reminder of what its like to live without one of three major north-south highways through Seattle. We put together a series of short videos to help you get ready for the closure. The videos cover a variety of topics ranging from alternative commute methods to tools that will help you stay informed. Theres no easy solution for getting around during the closure, but planning ahead is your best bet for avoiding the worst congestion. We hope the videos will help jumpstart your planning. We also encourage you to share tips and tricks with fellow commuters. Join the conversation by using the hashtag #99closure on social media. This is your "survival guide" for getting around during the #99closure. Learn about the tools that are available at www.99closure.org. Find us on Facebook and Twitter, and consider downloading the WSDOT and SDOT apps. Does the #99closure feel like Déjà vu? If so, it may be because we closed the viaduct in 2011 for one week as crews tore down the southern mile of the structure. You might also remember the heavy congestion that occurred while the viaduct was closed. Expect more of the same this time around. Why? Since 2011, weve seen tremendous population growth in the area. That means more cars on the road. The good news is that transportation infrastructure has improved some since then. The City of Seattle opened a new streetcar line, WSDOT opened the Atlantic Street Overpass by the stadiums and Sound Transit last month opened University Link. King County Metro is rerouting 12 routes and will deploy 22 extra buses to help maintain schedules. King County Water Taxi will add two extra trips to its Vashon route. King County is providing extra parking lots and spots along Harbor Avenue Southwest in West Seattle for Water Taxi riders. Seattle Police Department will direct traffic at key intersections. Temporary parking restrictions along key routes will facilitate transit and general purpose travel. SDOT is expediting planned intersection markings along East Marginal Way South to assist bicycle and pedestrian routes. Traffic flow and temporary parking changes will help get vehicles on and off Aurora at Denny Way, Wall Street and Battery Street. SDOT is restricting lane closure requests by third parties on city streets. I-5 express lanes will remain open in the northbound direction overnight. Southbound I-5 HOV lane between Mercer Street and Corson Avenue will be "open to all" during the closure. Cant avoid driving during the #99closure? Make sure to plan ahead before hitting the streets. Here are some tools you can use to make your commute as painless as possible. WSDOTs live map and traffic cameras show real-time conditions on state roads. SDOTs live map and traffic cameras show real-time conditions on local streets. Peak commute times will likely be longer than usual during the #99closure. We expect congestion to start earlier and end later in the day. For those who can, nows a great time to consider working from home, taking a vacation or changing your work hours. Many employers allow it, and the earlier you ask the better. Itll save you time, plus fewer cars on the road is better for everyone. We understand the major inconveniences caused by closing a portion of SR 99. Like you, we're looking forward to completing this part of the project so the viaduct can reopen and the tunnel team can continue on its way beneath downtown. Until then, thanks for your patience and assistance in helping your fellow travelers through the closure. 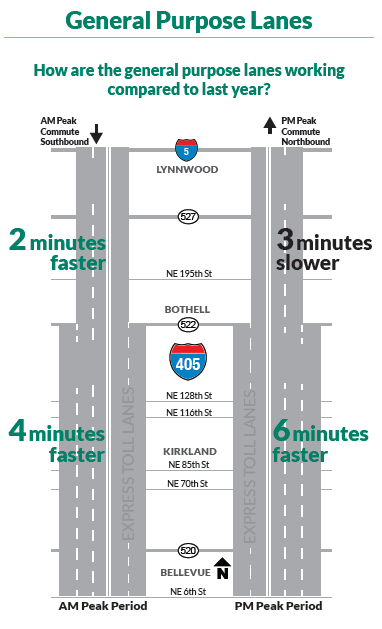 92 percent of the peak period traffic (3-7 p.m.) that sees speeds in the northbound express toll lanes at 45 mph or faster. This is compared to 44 percent for 2015 before express toll lanes opened. 90 percent: of the peak period traffic (5-9 a.m.) that sees speeds in the southbound express toll lanes at 45 mph or faster. 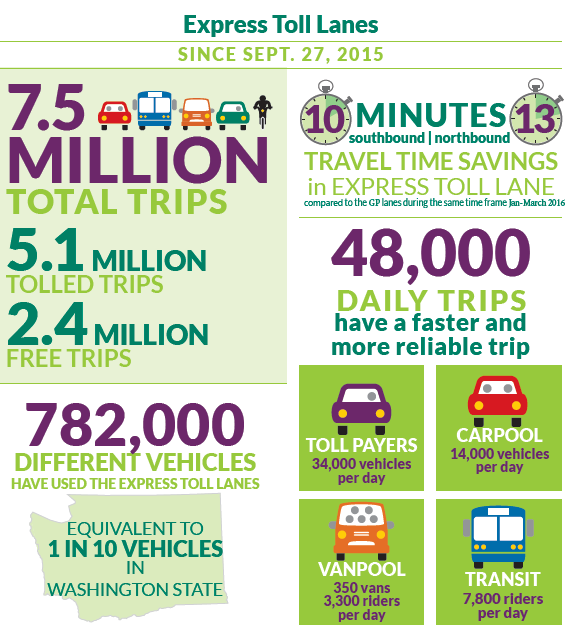 This is compared to 78 percent for 2015 before the express toll lanes opened. 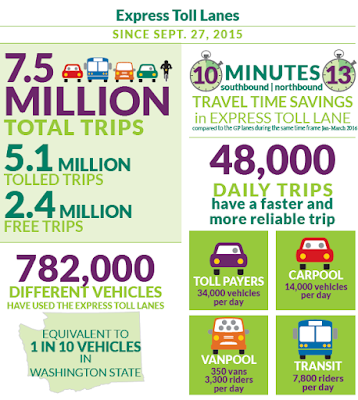 34,000: Average weekday number of tolled trips in the express toll lanes. 14,000: Average weekday HOV trips, representing 29 percent of all trips in the express toll lanes. 10 percent: Increase in King County Metro ridership on I-405 routes. Express toll lanes are now moving more vehicles throughout the entire corridor than the previous HOV lanes were last year. 40 percent: More vehicles in the northbound express toll lanes near SR 522 are moving during the peak hour than the same time last year. 84 percent of drivers continue to pay $4 or less per toll. 78 percent of weekday express toll lane users have a Good To Go! pass. 30: Locations on arterial routes parallel to I-405 that WSDOT has been monitoring for increased volumes and travel times. Interim data collected in February 2016 showed very similar trends compared to before tolling. Most agencies have reported no noticeable local changes. While the numbers are encouraging, we know that some drivers have been impacted negatively. There are drivers whose trips, especially between SR 522 and SR 527, have seen slower speeds since express toll lanes opened. We are working to expedite several adjustments, especially those to the northern section of the corridor, so that travelers will see improvement as soon as possible. This includes adding capacity through hard shoulder running. Since opening the express toll lanes, we've made some system adjustments to improve trips on I-405 in the express toll lanes and the general purpose lanes (full list). Changing the express toll lanes hours of operation from 24/7 to Monday through Friday 5 a.m. to 7 p.m. Since changing the hours of operation we've seen less congestion on the weekends. At the SR 520 interchange, lengthened access point and changed from weave lane to skip stripe to provide more open access to the express toll lanes. This lessened general purpose lane congestion in the SR 520 interchange area during afternoon commutes and weekends. NB I-405 added additional signage to clarify the access point to provide drivers more time to exit to SR 522. SB I-405 lengthened the access point to allow drivers to enter the express toll lane sooner. Our next quarterly financial report is due out next month. We'll also be out on the road making additional adjustments northbound at NE 85th Street. We will continue reporting out on express toll lanes performance, and we always welcome your feedback. Wear and tear are natural parts of aging for people, like an achy joint or skin that isn't as smooth as it once was. It's the same with our roads. Some sections of I-5 are more than 50 years old, and it shows. Some expansion joints and concrete panels are getting creaky and need replacing; ruts in the pavement need to be smoothed. 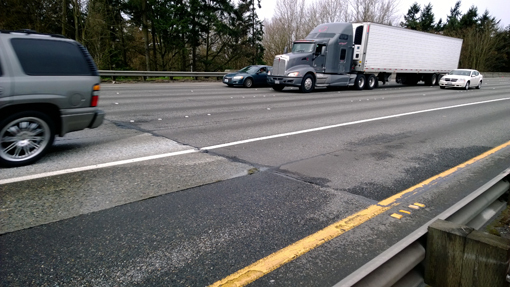 Worn lanes and rough seams are just a few of the issues on I-5. Just like aging issues for people, on I-5 some of these concerns can be fixed without a lot of disruption, while others may require a surgical approach that takes more time. A short visit to the doctor for some Botox can help smooth the skin; nighttime lane closures for grinding can smooth ruts in the freeway. 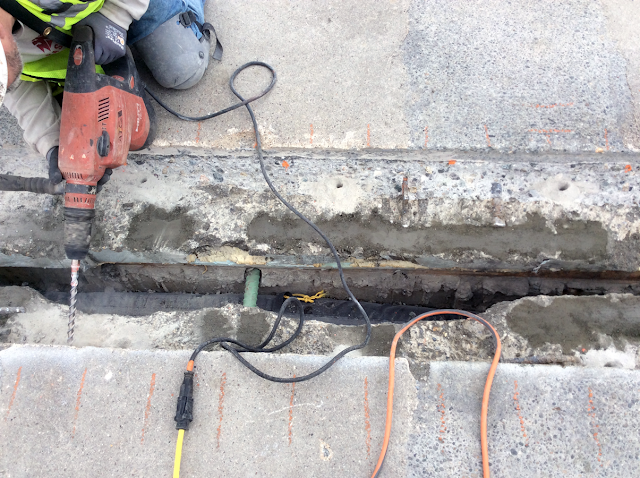 Getting a knee replacement involves a lot of work; so does replacing a bridge expansion joint. When it comes to southbound I-5, we've already started a project to rejuvenate the freeway between the Duwamish River and South 320th Street in Federal Way. Work on this 13-mile section will take about 18 months to complete. Most of it will be fairly painless, with work occurring during overnight lane reductions. Other parts will be a challenge. We need to reduce sections of southbound I-5 to two lanes on five weekends this summer, from 11 p.m. Fridays to 5 a.m. Mondays. The weekends are July 8-11, 15-18 and 22-25, and Aug. 12-15 and 19-22. Repave a section between SeaTac and Des Moines during the scheduled July weekends. 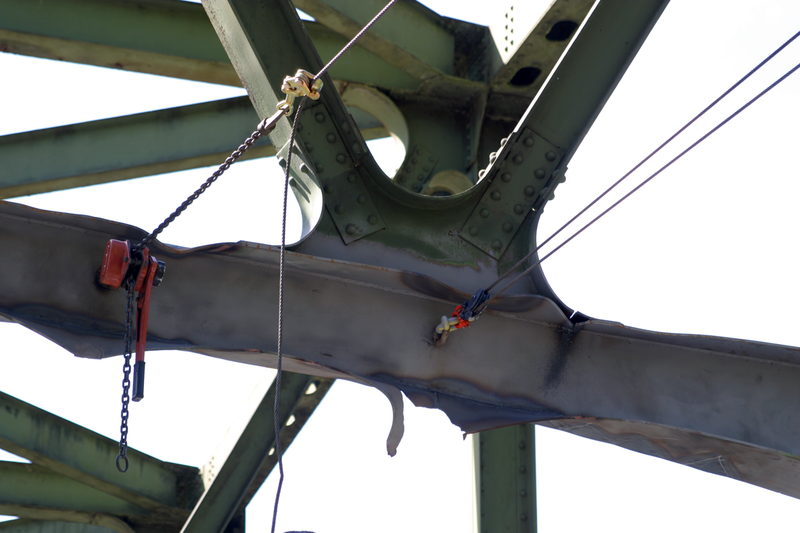 Replace expansion joints on the Duwamish River Bridge during the scheduled August weekends. remove the old joint, put in the new joint and new concrete, which then needs about half a day to cure. About 86,000 vehicles use this section of southbound I-5 daily in July and August. I'm not going to sugarcoat it – we're going to see southbound traffic backups on these weekends, starting in the morning, lasting throughout the day and into the evening. How big will they be? A lot of that is up to you, the drivers. Use an alternate route like I-405, SR 167, SR 99 or SR 509. Ride transit – King County Metro, Sound Transit or Link light rail. Travel outside of peak hours. We're working with south King County cities that will see increased traffic, as well as Sea-Tac Airport and Westfield Southcenter, to help spread the word to limit the delays. We'll also work with local media and use our project web page, the King County construction page, our blog, Twitter and Facebook to keep you informed. You can also download our mobile traffic app for the latest information on traffic. This project is one of many that you'll see in the next several years to rehabilitate both directions of I-5 in the Seattle/King County area. We're committed to restoring I-5 and keeping our region moving. It's going to take a lot of effort and patience, but together we'll make it work. Just like taking care of your body can keep you fit for a long life, restoring I-5 will keep our region's main highway healthy for decades to come. Measuring traffic on the SR 99 Alaskan Way Viaduct isn't as simple as you might think. Traffic volumes vary along the structure. For example, more vehicles drive the section south of downtown than the section near the Battery Street Tunnel. But no matter how you add things up, the end result is the same: thousands of vehicles will be forced to find other routes when the viaduct temporarily closes on April 29. And that will equal congestion and frustration, especially for drivers who don't plan ahead. As we collectively prepare for the #99closure, we're hearing lots of questions from the media and public about the current traffic patterns on State Route 99. More specifically, folks are trying to understand how those patterns will change during the closure. There's only so much you can do to predict how travelers will react when one of the two main north-south highways through the city shuts down. The only certainty is that traffic will be a major challenge. Here are a few numbers to help you understand what all of us will be dealing with. Let's start at the top. According to a 2014 survey by Commute Seattle, approximately 228,000 people commute into downtown each day. Of those commuters, about 45 percent take transit and 31 percent drive alone. The remaining commuters walk, bike, telework or find some other way to get to their job each day. Those numbers account for people, but the easiest way to understand the effect of closing the viaduct is to look at vehicles. According to our annual traffic count, the viaduct carries approximately 91,000 vehicles per weekday between the midtown ramps and the stadiums. By comparison, the Aurora Bridge carries about 74,000 vehicles on the average weekday. We've closed the viaduct enough times to know how it typically affects traffic. The structure shuts down twice a year for routine inspections. But those closures are intentionally scheduled on weekends, outside of weekday commutes. A better comparison occurred in 2011, when we closed the viaduct for a week to demolish the structure's southern mile. Back then approximately 110,000 vehicles used the viaduct each day, a number that has decreased due to a number of factors, including the curvy detour that was built to carry SR 99 traffic until the new tunnel opens. Much has changed since then. For one thing, Seattle has grown. According to the Commute Seattle survey, downtown has added 26,000 jobs since 2010. To go along with that, the city added roughly 6,000 new residential units to the downtown area between 2012 and 2014. Infrastructure has changed too. Back in 2011 the South Atlantic Street Overpass – which was built by the viaduct program and now allows trucks and other traffic to bypass a busy railroad track near the Port of Seattle's busiest freight terminal – didn't exist. We've also invested in changeable message signs throughout the city that alert drivers to traffic conditions, allowing them to make choices and more easily avoid congestion. Getting ready There are a number of things you can do to prepare for the upcoming closure. Our dedicated web page, www.99closure.org, is the best place to start. It contains a wealth of tips, maps and other resources designed to help you modify your commute. Up to 22 additional King County Metro buses on standby to help maintain transit schedules. 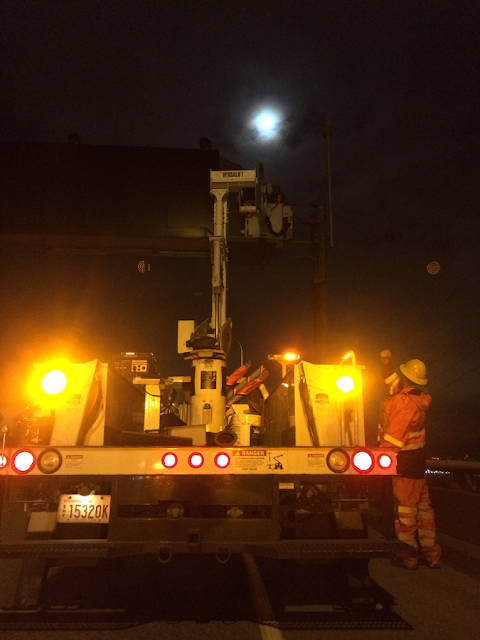 Additional WSDOT Incident Response Teams on I-5 during peak commute hours to assist with accidents and vehicle breakdowns. Signal timing adjustments to handle the anticipated changes in local traffic patterns. Uniformed police officers conducting manual traffic control in key intersections as needed. We put together a detailed list of mitigation efforts, WSDOT funding for mitigation, and other highlights of the traffic control plan. While there's much you can do to help reduce congestion, there's no getting around the fact that this closure will challenge even the most patient commuter. Even a quick glance at the numbers proves that closing a major highway is never easy, no matter how much you plan ahead. Hopefully it helps to remember that this is vital work. Replacing the viaduct is an important safety priority, and we're looking forward to completing a project that will transform the city and the SR 99 corridor. In the meantime, thanks for your patience. Please know that we're doing everything we can to keep traffic moving during this closure, and we appreciate you pitching in to do your part. If it feels like Snoqualmie Pass was closed to traffic more than usual this past winter, well, it was. 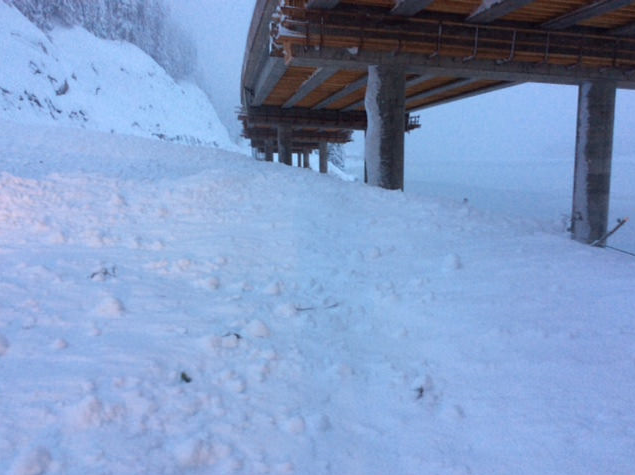 Some record snowfall leading to avalanche control, combined with a large number of collisions led to the pass being closed for almost 200 hours. as workers and drivers battled some record snowfall. Here's a look at the 2015 – 2016 Snoqualmie Pass winter closures by-the-numbers. Of the above closures, eastbound lanes were closed 101 hours and westbound lanes 96 hours. The pass had record breaking snowfall this season with 193 inches in December. The fourth week of December was the snowiest 7-day period in Snoqualmie Pass history with a record snowfall of 112 inches. Sixty percent of the collision closure hours happened in the fourth week of December and 85 percent of overall winter closures occurred the same week. Remember Christmas Eve? We do! The pass was closed for much of the day, stranding holiday travelers. Snoqualmie Pass received 37 inches of snow within 24 hours from December 23 to 24.
in December led to lots of avalanche control work as well. Two separate collisions were responsible for 21 hours of the 121 hours of collision closures. Both were tanker truck rollovers that created unsafe conditions on the road. Another 15 hours of collision closures were due to the investigation of a multi-vehicle fatality collision. With Work Zone Awareness week upon us, now's as good a time as any to remember that driving for conditions is vitally important, both for workers and for everyone on the road. The majority of these recorded collisions on Snoqualmie could be prevented by adhering to speed reduction, using proper traction devices, and obeying WSDOT's advanced warnings. This is a mountain pass and weather conditions change rapidly. We do our best to mitigate those hazards by installing rock fencing, patrolling the highways 24/7, clearing snow and closing the highway when high avalanche danger exists. But we need drivers to help by slowing down, driving for conditions and always focusing on the road. It's like our crews up on the mountain say "We can do just about everything short of driving your car for you." Despite being exceptionally clumsy and at times rather unlucky, I’d never found myself stuck on the side of a freeway before. As part of my job, I watch stranded vehicles through our traffic cameras and I’ve always wondered what it would be like to be exposed to the elements on one of our busy corridors. On Tuesday, April 12, I found out. 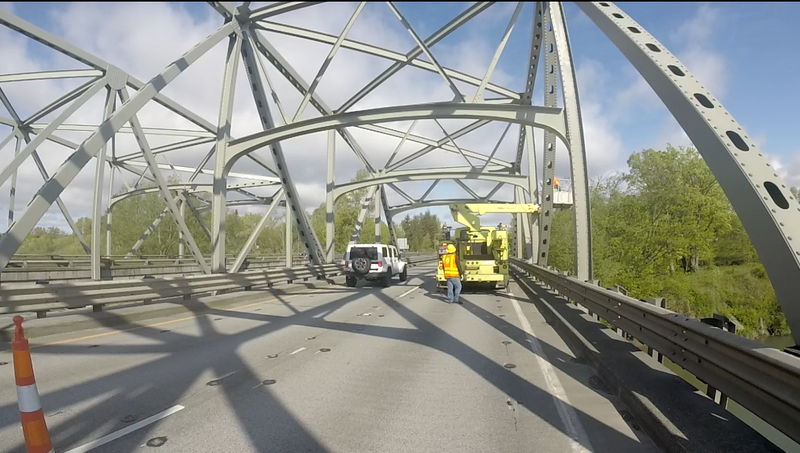 To better understand the experience of a highway crew, I spent some time with a bridge inspection crew working over the Nooksack River on I-5 in Ferndale. Like many of us, before coming to WSDOT I’d seldom given thought to the crews working behind the barrels, so I didn’t know what to expect. Arriving on site, the first thing I noticed was persistent, roaring noise. With each passing vehicle, I heard a loud rumble. On the bridge, an inspector mentioned that most crews religiously carry a pair of ear plugs because the relentless noise of speeding cars can be damaging over time. Stationary WSDOT vehicles also add to the blare; one truck can roar over 130 decibels, which is louder than a rock concert! It’s a tight fit to keep traffic moving across a bridge while keeping our bridge inspection crews safe. Even though the right lane was blocked off with traffic cones, the vehicles speeding by felt very close. Given this bridge’s structure, an Under Bridge Inspection Truck (UBIT) operation is already remarkably tricky. This special truck’s long arm extends down the side and under the bridge so crews can check the structure’s integrity from below. The truck’s operator must carefully weave the arm in and out of the bridge’s beams. It’s not easy to do this with only one lane of space. Traffic persistently plowed by and crews were forced to tiptoe between the truck and the edge. I felt a little Skywalker-esque as I used the Force to predict traffic flow onto the bridge. Even before I could see or hear vehicles, I felt them barreling near us. 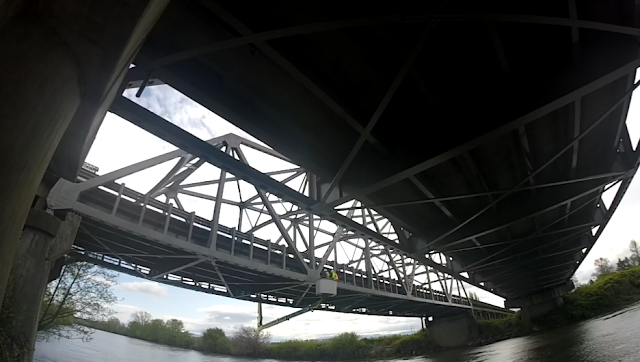 A bridge inspection offers some unique difficulties, because safety standards require crews to stay a distance away from the bridge’s edge unless they’re harnessed in. When speeding traffic zips by with such strength, it feels uneasy to move in either direction, even behind large traffic barrels. We need a safe work zone for bridge inspection to allow crews to get under the bridge to take a look. Leave plenty of space behind the driver in front of you. Abrupt stops and slowdowns near work zones lead to a lot of rear end collisions that endanger both drivers and nearby crews. Give ‘em a brake! Slowing down near a work zone creates a much safer environment for our crews. It gives drivers more time to react and can substantially lessen damage if a collision occurs. Merge on over. If there’s space, consider merging into a far lane as you move through a work zone. This gives crews a safety buffer. Pay attention! Distracted driving is even more dangerous in a work zone. Leave your phone in the backseat and keep a careful eye on the road ahead. Thanks for helping us keep the roads safe! 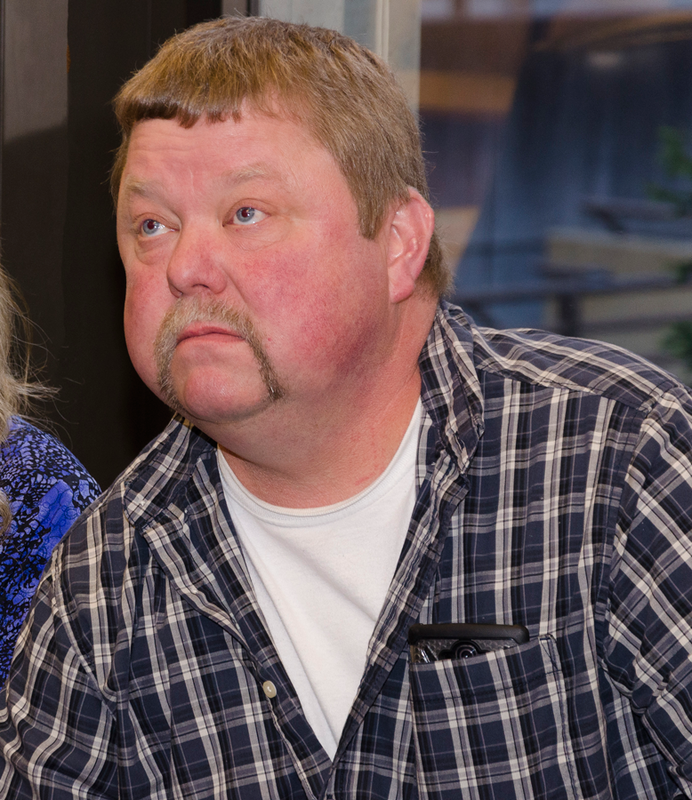 The sound of a jackknifed truck skidding toward him haunts Greg King's nightmares. He's slowly recovering physically from injuries in a work zone crash in January, but Greg, one of our Olympic Region maintenance technicians, said he can still hear the trailer coming at him as he ran for his life. His quick action got him far enough away that he was struck and injured rather than killed on that rainy January day near Aberdeen. But he's still not recovered. Greg came to WSDOT in 2001, looking for a job that allowed him to raise his three daughters as a single dad. The family-friendly schedule, he said, allowed him to make school and doctor's appointments for his girls, now all grown. His daughters sometimes worried about him on the side of the road, but Greg told them his crew took precautions and had equipment to keep each other safe. WSDOT worker Greg King, injured when a semi truck struck him on SR 105 in Aberdeen in Jan. 2016. Greg had had close calls before. Everyone who has worked on a work crew for any length of time has, he said. Our traffic analysts will tell you the top three causes of work zone crashes are inattentive driving, following too closely and speeding. Greg already knew that. He's seen drivers making breakfast as they come through work zones. Or putting on make-up. Or, more and more, talking on or looking at their cell phones. Anything but paying attention to the workers and safety signs. On Jan. 21, what Greg saw was a semi coming toward him as he flagged on State Route 105 near Aberdeen. The truck didn't slow down despite four posted warning signs of the work ahead. As the truck kept coming, Greg started running. He said he just knew he had to try and get out of the way, even though he feared it was too late. The truck driver, finally noticing Greg, hit his brakes, causing the truck to jackknife. That's when the trailer started skidding – right toward Greg, striking him on his left side. "It was like he was swatted with a fly swatter," said Harry "Butch" Blair, who was in the car behind the semi. "He went flying." Governor Jay Inslee thanks Butch and Connie Blair, who came to the aid of injured road worker Greg King in Jan. 2016. "I remember my feet going up over my head and thinking 'This is it,'" Greg said. Greg landed 60 feet away, face down in swamp water. Greg doesn't remember much about that, but Blair and his wife Connie rushed to help him, turning him over so he didn't drown in the water. His crew hadn't seen him get hit, so the Blairs were guardian angels that day. Greg's daugthers were called saying he'd been taken to the hospital, but they didn't know the extent of his injuries until they got there. His arm was broken, ribs bruised and he was black and blue from his shoulder to his ankle. He may need back surgery and he's still working to deal with the stress, sleeplessness and nightmares from the crash. It seems odd to say, given his injuries, but in a couple of ways Greg was lucky that day. By starting running he got far enough away from the trailer to not get directly hit. Troopers also told him that if he'd been flung forward instead of to the side, the trailer would have certainly killed him. And, of course, without the Blairs, Greg might have survived the crash but died from drowning. He doesn't want to count on being lucky again, though. And he doesn't want any of our other work crews to go through what he did that day. We've had two other workers injured since Jan. 21 – one on a road crew and another loading vehicles on a ferry – and a number of close calls. We're also seeing concerning driving patterns, with drivers failing to yield to emergency vehicles, driving erratically and speeding – sometimes in excess of 100 mph. 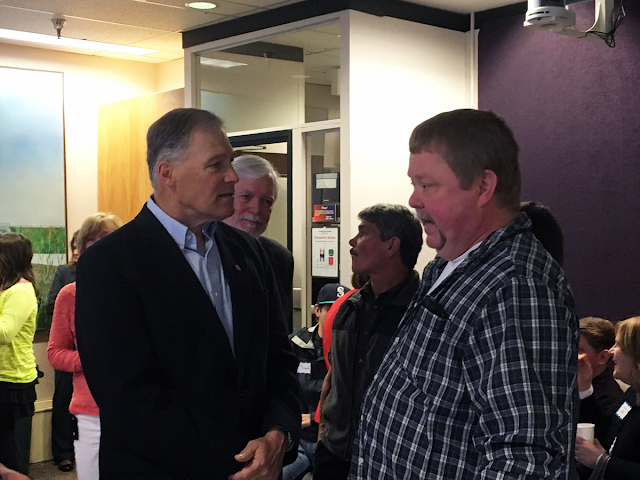 WSDOT worker Greg King shares his story with Governor Jay Inslee during the 2016 Worker Memorial event. Greg would like to see more education for new drivers about work zones and what the notices and signs mean. And, most of all, he'd like people to slow down and pay attention around work zones. This might be National Work Zone Awareness Week, but Greg said road crews – and all transportation workers – need to be safe 365 days a year. After all, he said, the work crews are out there to make the roads safer for drivers. Now, they just need drivers' help keeping the workers – and everyone else on the road – safe as well by slowing down and being extra alert around road crews or emergency vehicles. Greg hopes to return to work once he's healed, but he knows the sound of that skidding trailer will still haunt him at times. He hopes by sharing his story no one else ever has to hear that. Ours is a big state, with a lot of highway to both take care of and monitor. It's vital that we keep you updated on what's going on on the roads so you can make informed decisions about traveling, and so we have a group of communicators whose job it is to let you know before you go. We get quite passionate about our job and our projects, often feeling like 'ours' should take priority over the others (don't worry - we let you know about all of them). That's what happened this week and why you get to hear from me about an SR 410 bridge closure, northbound I-5 lane reductions and southbound I-5 overnight closure. I don't have a construction barrel in the race as we ramp up for this busy April weekend of highway improvement work. I just want you to know about everything that's going on in these two heavily traveled counties so you can plan ahead. Here are the biggies, from south to north. We start way down at the King-Pierce county line between Enumclaw and Buckley. If you live in either of these two cities, chances are you've heard about this closure – but if you haven't, listen up! Starting at 10 p.m. on Friday, April 15 the White River Bridge on SR 410 will be closed until Saturday, April 23. That's a 24/7 closure for everyone, from cars/trucks to bikes and pedestrians. We know there is no easy detour – expect your trip to be at least 45 minutes if you need to go from Buckley to Enumclaw or vice versa. Why will this take a week? Based on extensive community feedback, a week-long closure in mid-April was proposed by government and business leaders during a meeting with WSDOT on Nov. 5. A routine bridge inspection last year found that an overheight vehicle struck the bridge. Since then, we've had a temporary repair in place but a permanent repair is needed to keep it open for the nearly 20,000 vehicles that use it each day. Repairing the overhead structure of the bridge is a complicated process that requires us to close the entire bridge for a week to get it done. In addition to the people who live in these communities, skiers and snowboarders who want to hit the slopes at Crystal could be affected. Expect traffic and delays along this route so please give yourself extra time to reach your destination. 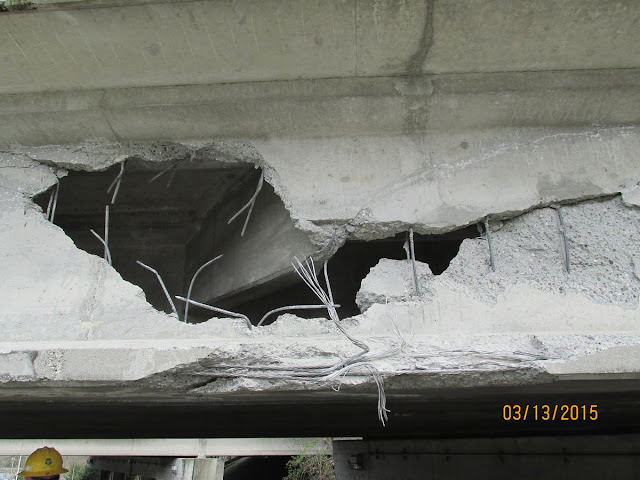 A full 24/7 week-long closure of the SR 410 White River Bridge will allow us to repair the damage done by an over-height vehicle strike. Weather hasn't been our friend for the #SnoCoSqueeze project in Snohomish County between Everett and Marysville. Contractor crews are wrapping up the southbound work and starting this week they will restripe the northbound lanes to prepare for weekend lane reductions. Once this striping happens (it depends on the weather), lanes will be narrower than normal and speed limits reduced to 45 MPH. The narrowed lanes and reduced speed limit will remain in place for several weeks over the northbound I-5 Steamboat Slough and Ebey Slough bridges until the project wraps up in mid-June. When the weekend expansion joint replacement work begins on Friday, April 15 at 9:30 p.m., northbound lanes will be down to one lane overnight and two lanes Saturday and Sunday. Three narrow lanes will open to traffic 5 a.m. Monday, April 18. There will be traffic delays but you can help minimize them by delaying non-essential trips and consider traveling in the early morning or later in the evening when traffic flow is lower. Even with changes to routines we expect backup and delays in this area to be similar to a weekday afternoon commute all weekend long. Tulip traffic has been busy into Mt. Vernon so expect it to be even more of a challenge this coming weekend. There's no ideal time to do this work but we're trying to get it done ahead of the busy summer season. to replace expansion joints on the Ebey Slough and Steamboat Slough bridges. Just north of the #SnoCoSqueeze on I-5 at 116th Street Northeast in Marysville is a big Tulalip Tribes project. Work in ongoing to widen ramps, replace the existing overpass (you may have noticed that half of it was demolished last weekend) and adding turn lanes, bike lanes and sidewalks. 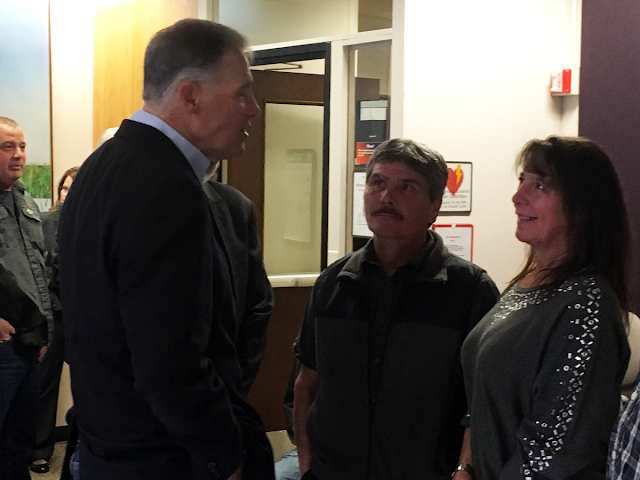 Tulalip Tribes are working closely with us as well as cities and counties around the area and are implementing this project in phases to improve traffic and reduce congestion. When finished, these improvements are expected to reduce crashes in this area by half and reduce vehicle delay by nine minutes during peak times. With 46 million tons of freight moving through this interchange daily, the improvements will also decrease the cost of moving goods around the region. To continue this work, all lanes of southbound I-5 will be closed from 11:30 p.m. until 7 a.m. both Friday and Saturday nights. Both directions of 116th Street will also be closed as crews demolish the west side of the overpass. For I-5 drivers, the detour will just be an off-ramp to on-ramp detour back onto the interstate. The left lane of northbound I-5 will also be closed for the safety of travelers. It's a challenge trying to get all of our work done with as little traffic impact as possible. Sometimes, it's impossible to avoid and so we ask that you stay plugged in and know what to expect before heading out. Check our construction update website, follow us on Twitter and download the WSDOT app to stay updated, and we thank you for planning ahead and being patient as we get these projects done. Close your eyes (well, pretend to and keep reading) and imagine you're on a boat. Feel the waves rocking underneath as the blue water sparkles in the sun. The wind is blowing a salty breeze through your hair. You hear the faint hum of engines as other boaters enjoy the day around you. The waves rocking is actually the bridge span swaying as traffic zooms by. There is water under you, but it's a LONG way down – more than 120 feet down. And at 1 a.m., that water is pitch black, not sparkling blue. The wind is blowing but it's a biting chill over the Montlake cut and it's throwing up car exhaust instead of a saltwater breeze. The faint hum of other engines is cars and semis heading up the incline of the bridge. Bridge while others provide traffic control on the ground. All of that creates a working environment that isn't for the faint of heart. It's hard enough working on a swaying bridge at night, but add vehicles whizzing by, and it can be downright scary. Thankfully on the night I joined the signals crew on the bridge, drivers respected the work zone and most merged left to give the crew some safe room to get the job done. When we have repairs or projects that require lane closures, we try to do it in the overnight hours when there is less of a traffic impact. But nighttime conditions create their own challenges, including an increase of DUI drivers – WSP says the busiest time for them removing DUI drivers is from 11 p.m. to 3 a.m. - the road and decreased visibility due to the dark. It can be a scary situation for road workers. We set up our traffic control to do our best to protect crews. We display signs and use cones and barrels in advance of our work to notify drivers. And we use road warriors and other vehicles with flashing reader boards and crash barriers to protect workers. But that traffic control isn't always enough. We are just three months into 2016 but already we've had more than a dozen work zone crashes in the Northwest Region (Federal Way through the Canadian border) that involved the traveling public. These include illegal turns onto a highway into a WSDOT truck, an unsecured ladder flying off a vehicle into a WSDOT truck and an employee being hit by a car while providing traffic control. We often hear that our workers are "just standing around." In truth, there are multiple reasons you may see a worker standing by. In this case, while two workers used a bucket truck to get inside a VMS to fix its controls, others were on the ground scanning the highway for anything that might put their teammates at risk – the semi with an oversize load, the SUV weaving across lanes, the sports car going way too fast. These workers on the ground are needed to help implement initial traffic control and then they're the eyes for the workers who are inside the sign or are bent over a guardrail putting bolts back in place. 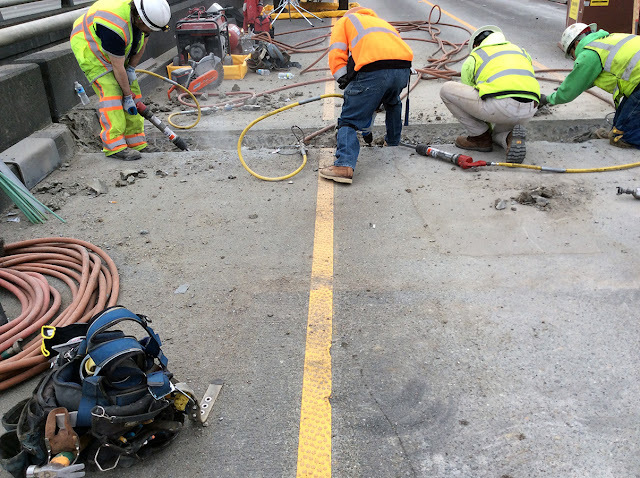 These are some of the things WSDOT does to help keep work zones safe, but we need your help. If you see flashing lights, whether it's an emergency vehicle or a construction vehicle, please merge away from it or slow down. Pay attention to the orange construction signs that are up on the road. These signs are helping to tell you what's closed so you can make early decisions about an upcoming work zone. Spread the world. This week support the #GiveEmABrake initiative and don't be afraid to spread the message year round. The night I was out with the signals crew we had courteous drivers on southbound I-5. Most of them merged away from the work zone or were able to reduce speeds. The signals crew managed to get most of the VMS working again. But when I returned to the office an hour later, I heard the always dreaded information come in – work zone crash. A black Mercedes crashed into one of our WSDOT trucks out fixing a pothole and took off. This was just yards from where I'd been with the signals team. My heart sunk and my mind started racing as I thought first of my colleagues that might've been hurt and then my mind turned to "that could've been me!" Luckily, none of the crew was hurt. I'm very glad we all made it home to our families that night. Please, help me work to ensure that happens every night. 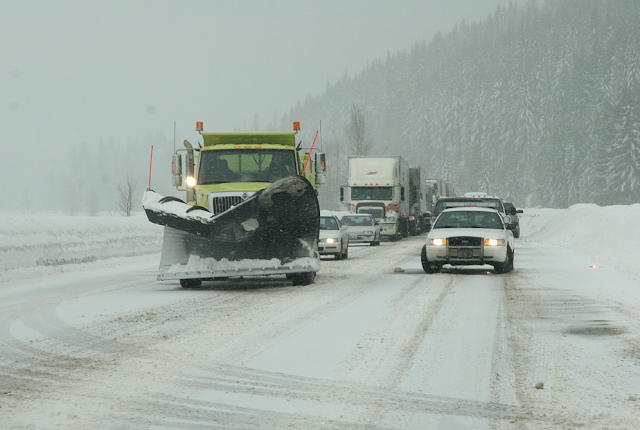 We want all work zone crews and the traveling public to go home to their friends and family. Don't drive distracted and Give Work Crews A Brake, it's not paradise out there. That's the number of our workers killed in work zones since 1950. That's 59 parents, spouses, sons and daughters who didn't come home one night. It's also 59 families who will never be the same. And numerous co-workers haunted by losing one of their own. We strive to honor our fallen workers every day with our commitment to safety and our efforts to continually improve equipment and training. This week, however, we take some extra time to remember the men and women killed while simply doing their job. It's National Work Zone Awareness Week, with states across the country pausing to remember workers lost on the job and to reinforce work zone safety messages. In Washington, we will honor our fallen workers and their families at our Worker Memorial ceremony in Olympia on Wednesday, April 13. Working on the side of a roadway or construction site has inherent dangers. Our workers know that and take great pride in following safety standards to keep themselves and their crews safe. "We look out for each other," they tell us, "we watch each other's backs." And, as an agency, we work to get them the best equipment and materials to keep them safe. Our truck mounted attenuators – a high-tech accordion-like device on the back of a vehicle – protects crews by absorbing the blow from a vehicle entering the work zone. Automated flagger machines are being used in areas where it's just too dangerous to have someone standing next to traffic. But we still need the public's help to keep both our workers – and themselves – safe. In just the past few months our crews have experienced injuries and a number of close calls. We're seeing drivers failing to yield to emergency vehicles, driving distracted or erratic and speeding – sometimes in excess of 100 miles per hour. Workers tell us they see drivers blow past work zone signs while looking at their phones, eating food or putting on makeup – anything but concentrating on the road and keeping themselves and others safe. 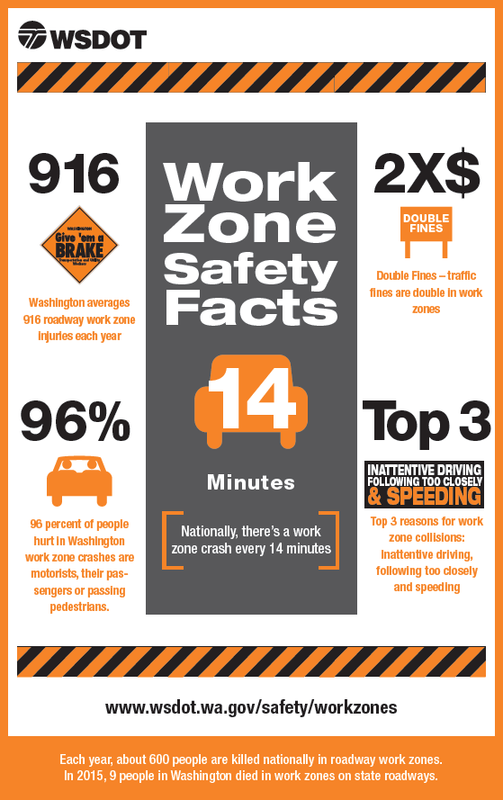 The top three causes of work zone crashes in our state are: inattentive driving, following too closely and speeding. All of these are preventable by drivers simply slowing down and being extra alert around road crews. Slowing down in a work zone not only keeps our workers safe – it protects you and your loved ones as well. Ninety-six percent of people hurt in work zone crashes in Washington are drivers, their passenger or passing pedestrians. While, thankfully, no WSDOT crew members were killed in 2015, nine people in the state did die in work zone crashes or backups caused by them. Even one such death is too many. Please help us keep everyone in and near our work zones safe. Remember, slow down, pay attention and obey all traffic signs in a work zone. Together, we can help ensure everyone returns home safe to their family every night. Holy bridge damage, Batman! Is this thing safe? 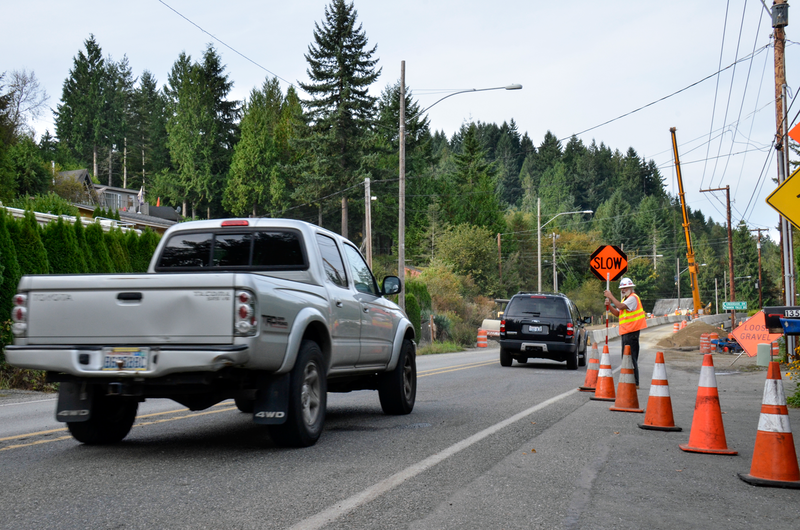 At the north end of Issaquah's Front Street, drivers have been gazing into - yes INTO - a hole in the Interstate 90 overpass for more than a year. After a garbage truck hit the bridge in March 2015, bridge inspectors completed a thorough evaluation and determined it was safe for drivers. While we've continued to monitor the bridge to ensure it remains safe to travel over and under, it's still an eye sore and hard to miss as you travel north from historic downtown Issaquah toward the freeway on- and off- ramps. So what's the hold up on getting this thing fixed? While construction work is less than a month away, work behind the scenes to replace the damaged bridge girder has been in full swing since the truck pierced the hole in the bridge. A garbage truck punched a hole in Issaquah’s I-90 Front Street overpass but a project to repair the damage is scheduled to begin in May. Replacing a bridge girder takes planning, designing, hiring a contractor for the work, traffic control plans, coordination with other projects in the area, removing the damaged girder and replacing it with a new one. The most time consuming part of this process is creating the replacement girder. Unlike a hole in your favorite pair of jeans, engineers can't hit the outlet mall for a replacement. It is a specialty item and needs to be made specific to the bridge. With very few fabrication contractors in the region, the Front Street girder had to "wait its turn" so to speak. Yes, it is possible to pay a fee and get the 114' girder to the front of the fabrication line. Since this isn't an emergency fix, and the bridge is safe for travel, we elected to save the money and not pay the extra fee. Now that the replacement girder is built, contractors from Massana Construction, Inc. are finalizing technical plans to remove the old girder and install the replacement. Construction is scheduled to start in May, and expected to last 48 days. When it starts, expect some road closures and detours so stay tuned as we near the start date. It’s a bird, it’s a plane, it’s a giant fan? If you live on Mercer Island, use the Interstate 90 Trail or spend time at Aubrey Davis Park, you might have noticed an unusual sight on Tuesday, April 5 as six new fans arrived at the Mercer Island Tunnel. Contractor crews working for WSDOT and Sound Transit used giant cranes to off-load the 10,000 pound fans from flatbed trucks parked on West Mercer Way into the Mercer Island Tunnel building located in Aubrey Davis Park. 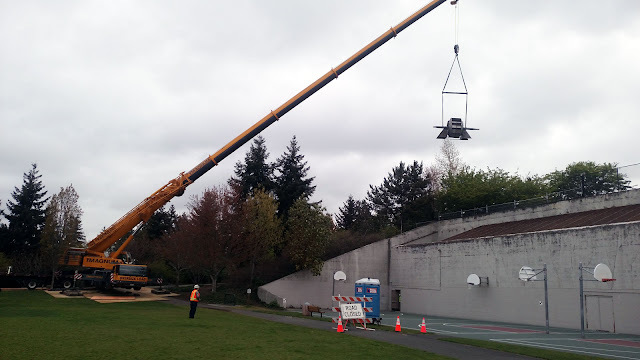 Contractor crews lift one of the 10,000 pound fans into the Mercer Island Tunnel ventilation building. The building is located under the tennis courts at Aubrey Davis Park. We have two types of fans inside the Mercer Island Tunnel: supply fans which bring in clean air from the outside, and exhaust fans which take dirty air out of the tunnel. The six fans delivered today are supply fans and will work in conjunction with the large metal pieces and trusses that crews lifted into the ceiling and installed during this spring’s eastbound weekend work. Together these pieces will work together to better clear exhaust or smoke from the tunnel in an incident. 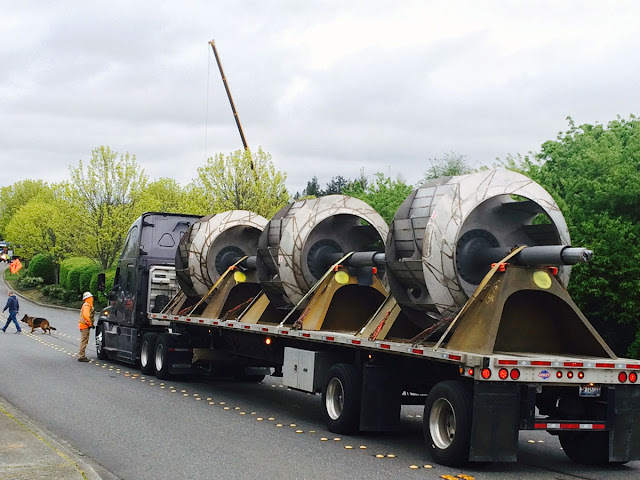 Similar metal pieces and trusses will be installed westbound during the project’s next weekend detours weekend detours scheduled for May 20-23 and June 3-6.
that were delivered to the Mercer Island Tunnel on April 5. Why do we need new fans inside the Mercer Island Tunnel? In order to add all-day carpool lanes on I-90 by squeezing in a fourth lane in both directions, contractor crews need to upgrade the tunnel’s fire detection and ventilation systems, which includes fire sprinklers and hydrants, cameras and other items that help to keep drivers safe in the event of fire or other incidents inside the tunnels. While our maintenance crews do a great job keeping these systems in working order, it’s time to give things a much-needed upgrade. The last time we made any big changes to the tunnel systems was about 25 years ago when I-90 was rebuilt. As the years go by it’s tougher to get replacement parts for these aging systems, not to mention keep up with the advances in technology that have happened since then. All of this work will wrap up by mid-2017 to allow Sound Transit to begin construction for the East Link light rail project across I-90. 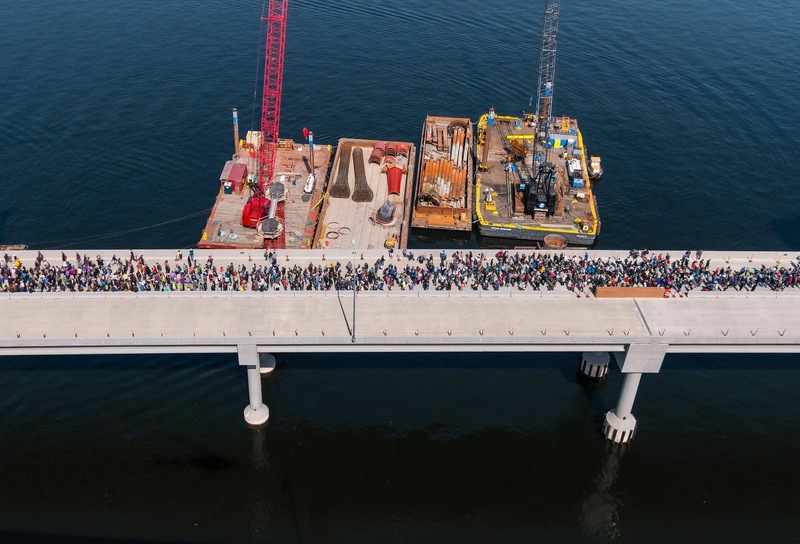 We want to thank all of you who helped us celebrate the new 520 bridge this weekend – it was a fun and exciting day and we were thrilled to see so many people out enjoying the longest floating bridge in the world. It was thrilling seeing so many people soaking in the weather, the exhibits and the bridge itself. 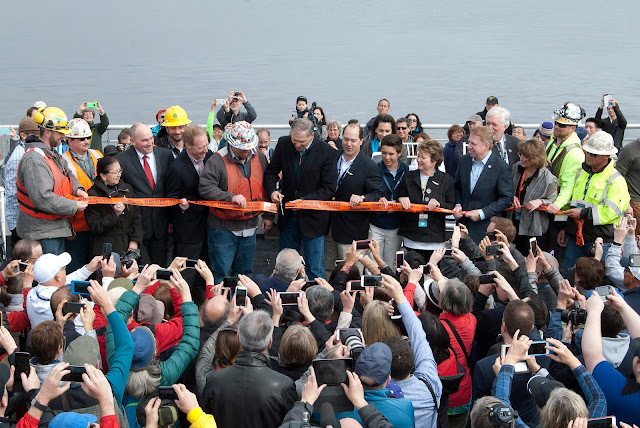 The ribbon cutting was an exciting official start to the day and experiences like the LEGO floating bridge, bridge passport and cutting a keepsake piece of the ribbon will be fun memories for years to come. An estimated 13,500 people ran or walked in the Saturday morning Fun Run, breaking the bridge in in style. Between 25,000 to 30,000 people joined us on the bridge to watch the ribbon cutting, visit numerous exhibits and take in the views. On Sunday, another 7,000 people rounded out the grand opening in the Emerald City Bike Ride. All told, that's 50,000 people walking, biking, running and experiencing the new floating bridge before it opens to traffic later this month. Despite some challenges, we are very happy to report there were no major injuries, medical issues or security problems. We’re pleased so many people got to enjoy the bridge safely and take part in a truly historic, unprecedented event. Though there were long lines, visitors we spoke to on the bridge enjoyed the event and the chance to explore and celebrate the bridge before it opens to traffic and to visit with engineers and learn about the new bridge. Children seemed particularly thrilled with the hands-on activities, including several Science, Technology, Engineering and Math exhibits as well as the chance to climb into Broom Hilda, the bridge’s new state-of-the art street sweeper. We would also like to thank all of the partners and sponsors that made this free to the public event possible. Our presenting sponsors were Microsoft and Delta Air Lines, along with KIRO 7 as our media partner. We had a total of 55 sponsors that all contributed to the success of the weekend—both monetarily and with activities and staff to talk with our tens of thousands of visitors. 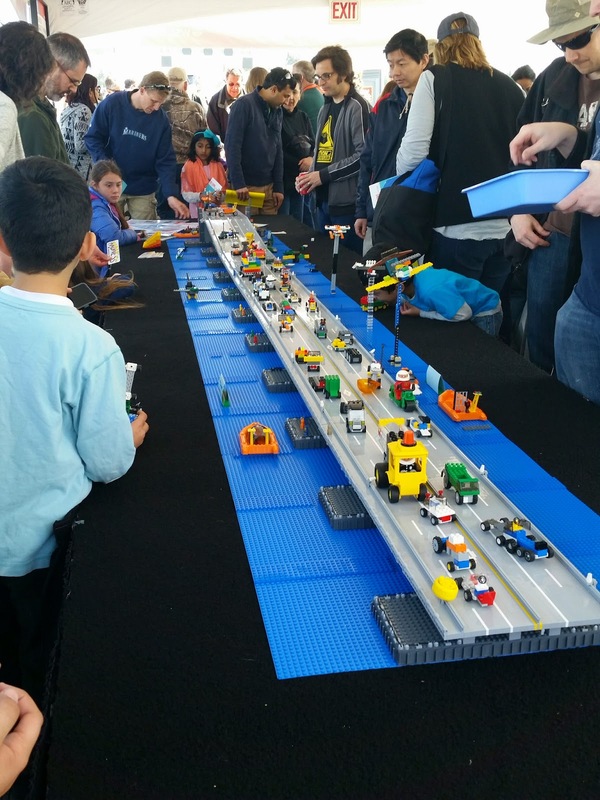 We loved seeing people enjoy our bridge this weekend and again thank everyone who participated and helped us celebrate this Guinness World Record bridge. Follow along today as we celebrate the grand opening of the new SR 520 Floating Bridge.